I am a futuristic Hemingway. I've donned my safari hat, packed my elephant gun, and gone hunting in an alien jungle. 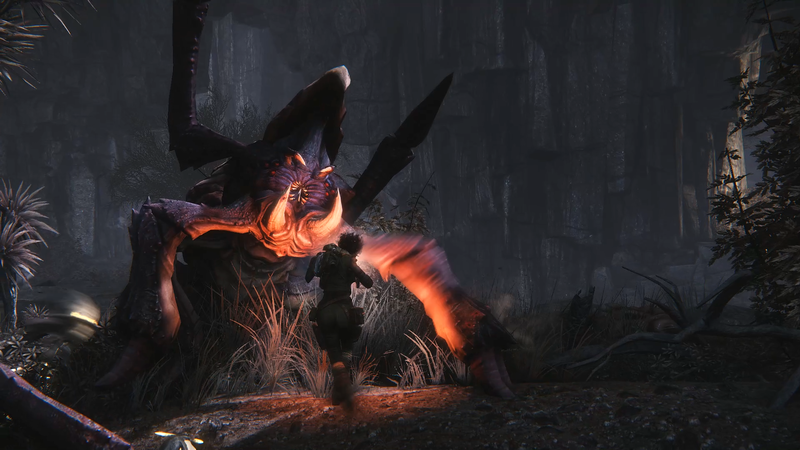 I'm playing Evolve, the new game from Left 4 Dead developers Turtle Rock Studios. It's fantastic. 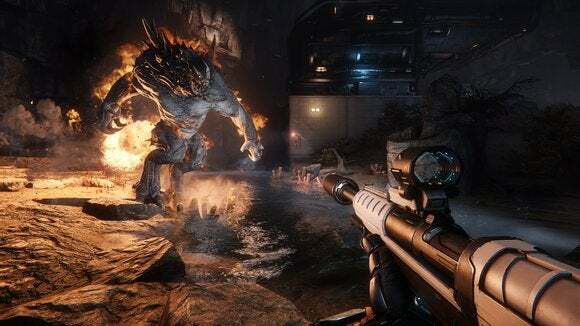 Evolve is sort of a competitive multiplayer shooter, sort of a cooperative multiplayer shooter, and sort of like no game that's ever been made before. Mostly that last one. On one side is a dynamic that should feel familiar to Left 4 Dead fans—four people (dubbed Hunters) with guns. Each of the four characters on this team slots into a specific role, so you have an Assault class, a Medic, a Support, and a Trapper. That last one, the Trapper, plays into the theme of Evolve: You're game hunters. As in "wildlife" hunters, not people who hunt down video games. The catch? The monster you're hunting is controlled by another player. Turtle Rock has only shown off one monster so far, the Goliath, but promises more to come. The Goliath is ultra-mobile, scampering up walls and charging into battle. It also breathes fire and can throw rocks. The monster must survive long enough to kill all four Hunters, or to destroy a secondary objective (on our map it was a generator). 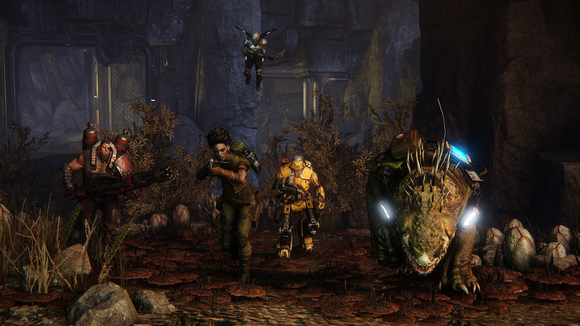 A team of Evolve Hunters, complete with pet Trapjaw. This is what the Hunters are up against. To succeed, they'll have to use all their various class abilities in concert to take down a monster that only gets more powerful as the game goes on, as the monster levels up over the course of the round and gains access to new abilities. The Trapper is key to the whole operation, outfitted with harpoons and other mobility-restricting items to prevent the monster from escaping. Not that the other classes aren't important. The Assault class obviously will do most of the damage, the Medic will help keep the group alive while also staying at the back lines with a trusty sniper rifle, and the Support class gets everyone out of tight situations with a cloaking field. It's quite a dynamic, and the classes I played (Trapper and Support) felt both engaging and useful—important, considering you can only have one of each class per game, and nobody wants to get stuck playing the boring class. Turtle Rock showed off four new Hunters this time around: Hyde (Assault), Maggie (Trapper), Lazarus (Medic), and Bucket (support). Hyde is just a big guy with a flamethrower built into his arm. As a straight-ahead damage-dealer, I actually find the assault class the least interesting. But hey, the character design is great and if you're just in the business of wrecking monsters then Hyde's your guy. Maggie has a pet Trapjaw (one of the lower-tier wildlife specimens that infest the map) which she uses to track the monster. This gives players an edge, provided they can move fast enough to catch up with the Goliath. She also can lay harpoon traps, which prevent the monster from moving, and in a pinch can throw down a mobile arena—a gigantic dome that traps everything inside. 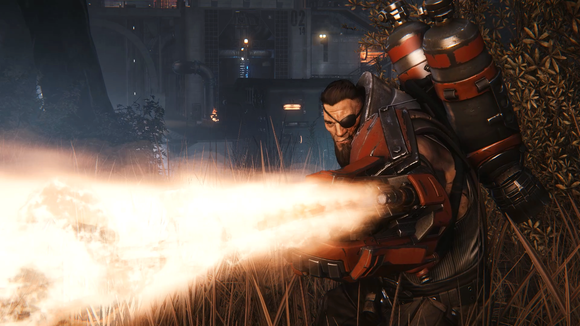 Lazarus, true to his Biblical name, is a medic that can bring downed team members back to life. This can be enormously frustrating as the monster; you think you're making good progress, and then suddenly half the Hunter squad is brought back to life. And since Lazarus has a personal cloaking device, it can be hard to figure out where he's disappeared to. He's a formidable challenge to an unwary monster. Then there's Bucket, the Support class robot. Want to know the best thing about Bucket? He can take his head off and fly it around like a drone to spot the monster and packs full complement of missile launchers and sentry guns. 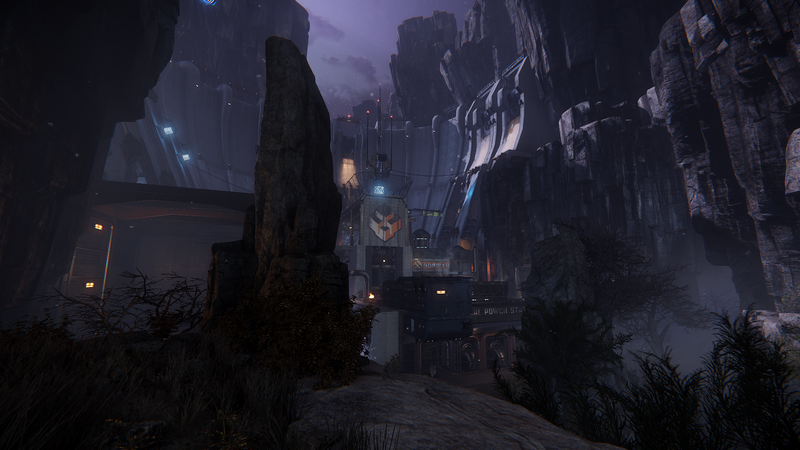 We also got a first look at a new map, "The Dam," which is a desert environment. If you think the monster is the most dangerous thing out there, well, you're right. But only barely. Random wildlife roams the map and will absolutely destroy your team of Hunters if you're not careful. During one match our team managed to reduce the Goliath to a mere sliver of health—I'm talking one more bullet might've killed it. The Goliath escaped to nurse its wounds, and we gave chase. Those hulking things are called "Dune beetles." We chased it right into a group of angry animals, one of which then took down our Lazarus. With no way to revive downed teammates, and us scattered to the wind, the Goliath managed to pick us off one by one. It was a stunning comeback—and all because we were arrogant. Respect nature. That's the message I'm getting from Evolve. In all seriousness, this is definitely a game I look forward to playing more of when it releases this fall. The worry, of course, is that the game becomes rote after playing a few rounds. So far, however, everything seems tightly balanced and always unpredictable. If the team at Turtle Rock can keep Evolve to these two mantras, I'll be excited.